Cracked Out Egg Salad - OMG! Seriously delicious!!! Eggs, mayonnaise, Ranch mix, cheddar cheese, bacon, celery, vinegar and Worcestershire. Can make ahead of time and refrigerate for later. I always make a double batch and it is gone in a flash! Everyone loves this easy egg salad recipe. This is the BEST Egg Salad recipe! 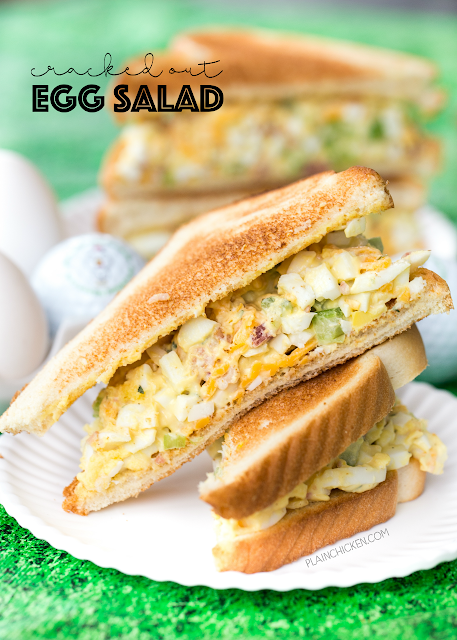 One of the classic sandwiches at The Masters is an Egg Salad Sandwich. We eaten them and they are delicious. I have a copycat version on the blog that is better than the original. Seriously! Try it! I decided to kick that version up a notch and crack it out. If you aren't familiar with my version of crack, it is a combination of cheddar, bacon and ranch. It all started with a crazy good dip way back in 2007. I made a cheddar, bacon and ranch dip for a Titans football game. It was so good that we couldn't stop eating it. We said it was like crack, and thus the name was born. 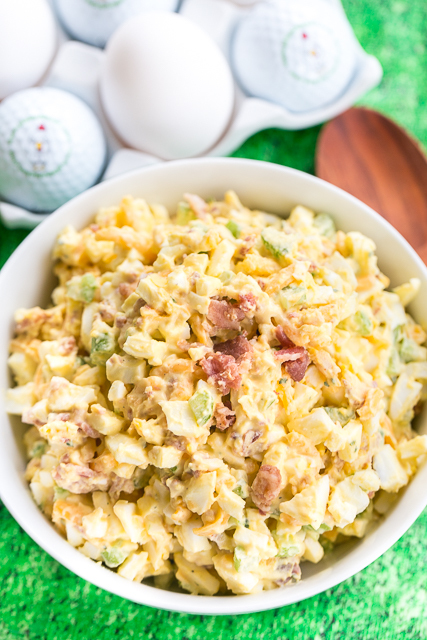 I wanted to jazz up our usual Masters Week menu, so I cracked out my Masters Egg Salad. OMG! I used some dry ranch mix and added cheddar and bacon pieces to my recipe. It was SO good. I might actually like it better than the original version. This Cracked Out Egg Salad is really easy to make. Chop up some hard boiled eggs and add the remaining ingredients. It literally takes about 5 minutes to make and is seriously delicious! You can make this egg salad a day in advance and keep it refrigerated until you are ready to serve it. It will last about 3 or 4 days in the refrigerator. It never lasts that long in our house though. We ate this on toasted bread, but it would also be good on a croissant or just on some crackers. Chicken Legs has already requested this for Masters Sunday! What to serve with Egg Salad? To cook the eggs: Place the eggs in a single layer in a heavy saucepan and cover with cold water by at least one inch. Add a teaspoon of salt. Leaving the pot uncovered, turn the heat to high. As soon as the water comes to a boil, turn off the heat and cover. After 10 minutes, remove the cover and run cold water over eggs for 1 minute. To peel, gently tap each egg against the counter, turning to make a crackle pattern. Start peeling at the broad end, where there is an air pocket. To make the egg salad: Chop hard boiled eggs. Combine eggs with remaining ingredients and chill. You can make this egg salad a day in advance and store in the refrigerator. I'm bad to never comment on blog posts. But I wanted to say Thank you for sharing the recipes. I have made so many of them and have so many more saved to try! Have a great week!! This is probably a dumb question, but do you use white vinegar or apple cider? I'm getting ready to make this, can't wait! I used white vinegar. Enjoy! Is "ranch mix" a powdered ranch dressing/dip mix? Thanks. yes - I used Hidden Valley Original - I linked to it in the ingredient list above if you want to see it. Do you know what the macros are for this? It was SO good!! Thanks for sharing! I think this is the 3rd week in a row I've made this. Addicted.